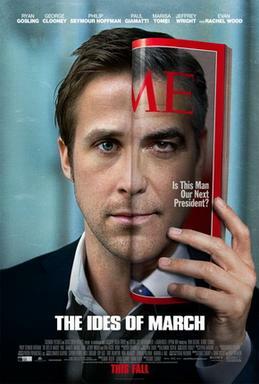 Simultaneously hopelessly idealistic and cripplingly cynical about the processes of American democracy, The Ides of March is crisply written, superbly acted, and shot and composed by director, co-writer and co-star George Clooney with tremendous technical and aesthetic skill that some of his less well-crafted recent projects (The Men Who Stare at Goats, The Monuments Men) could have definitely used. Like the realm of American political campaigning that the film depicts, The Ides of March has grand, serious ambitions and righteous intentions (the Shakespearean referential title is only the tip of the iceberg) but ultimately, underneath the hustings, is a sensationalist knife-fight in the muddy gutter. Its lingering and most pernicious message is that no righteous cause in the irrevocably fallen world of American politics can even begin to be put into motion without copious muddy splattering. The Ides of March is an allegorical opus of the enlightened paralysis of the neoliberal elite in particular and the cross-spectrum ruling class of America in general. In a forbidden meeting in a Cincinnati sports bar that comes back to haunt brilliant junior campaign manager Stephen Meyers (Ryan Go sling), Tom Duffy (Paul Giamatti), the campaign manager of the candidate contesting the Ohio Democratic primary against his candidate, tells his young rival that Democrats needs to learn from the disciplined ruthlessness of the Republican Party’s sharp-edged political operators, need to put some steel in their spines and dip their daggers in poison. It’s the hoariest of stereotypical, oxymoronic canards about the Democratic establishment, that they must abandon their stubborn principles of justice and fairness to achieve electoral victory and thus advance their principles of justice and fairness. But Stephen, almost against the expressed wishes of his own soul, takes these words to heart and follows them to their obvious conclusion. Meyers’ candidate is Pennsylvania Governor Mike Morris (Clooney), whose campaign is run by wily campaigning vet Paul Zara (Philip Seymour Hoffman). In a near dead-heat for Ohio with Duffy’s Arkansas Senator Ted Pullman (Michael Mantell), Morris’ team considers moving on to push harder in North Carolina or, more temptingly, to court the endorsement of Franklin Thompson (Jeffrey Wright), a former candidate who could deliver enough delegates to all but clinch the presidential nomination but who demands a steep price for his help (and whom Morris dislikes intensely). Meanwhile, Meyers kindles a sexual liaison with a young intern named Molly (Evan Rachel Wood) who also happens to be the daughter of the head of Democratic National Committee and may have a damaging connection to Governor Morris as well. Meyers claims to be a principled operator, willing to fight hard and smart but not especially dirty for Morris, a man whose vision for America inspires him. That vision, admittedly, is part of the problem with The Ides of March. Morris is the sort of progressive American politician who can only be allowed to exist in the movies, expressing deeply unacceptable candid views on energy, social history, foreign policy, and the War on Terror and proposing two years of national service for every citizen over the age of 18 in exchange for free government-funded college education (the only debate inside the campaign is whether to make it mandatory or not). We meet not a single conservative in the film; the GOP here is like Sauron in The Lord of Rings, lurking menacingly behind a wall of metaphorical mountains, unseen but implacably evil. But it’s quite clear that they would consider Mike Morris the Antichrist with the zealous fervour imbued in them by their singular fusion of faith and ideology. Many Americans of more modest but equally rigid preconditioned views would find him unacceptable too. An emphasized early debate talking point sees Morris speak the words, “I’m not a Christian”. Then, my apologies, Governor, but you are also not the President of any United States of America that currently exists. If The Ides of March has problems, they are emphatically not ones of technical craftsmanship. Clooney (who co-wrote the screenplay with frequent collaborator Grant Heslov and Beau Willimon, adapted from the latter’s play Farragut North) applies his strong cast with painterly strokes. Gosling’s brief blaze of thespianic glory may have flickered out but this role should be considered among his top acting achievements in a notable run of performances, and of course reliable veterans like Hoffman, Giamatti, Wright, and Marisa Tomei (who plays a New York Times reporter) bring a cracker of a script to vivid life. It may rely too heavily on melodramatic elements, yes, but the plot progression is more toppling dominos than contrived swings and that is to the writers’ credit. Clooney also employs striking visual techniques to deepen that script’s impact. A fateful early argument between Zara and Meyers leaves the latter silhoutted alone backstage at a campaign event in front of a towering, inverted Stars and Stripes backdrop, like a humbled mirror image of George C. Scott’s aggressively confident Patton. Meyers is exquisitely manicured and contained, but Clooney allows the anguish of a tragedy that the character later exploits to achieve his goals to be projected onto Gosling’s face as backlit rain on the windshield of his car. It’s a striking use of lighting, as is Meyers’ entrance into a darkened restaurant for a climactic meeting with Morris, bars of streetlight and kitchen glow halving Gosling’s profile and illustrating his knife’s edge balance between light and dark. The philosophic framing of the problems of the democratic process relied upon by Clooney in The Ides of March focus on classical moral dilemmas and, as the closing scene suggests, on the Rousseauian gulf between surface appearances and hidden truth. Policy-wise, Clooney’s Mike Morris is presented as a utopian, transformative figure. With the film’s release in the lead up to Barack Obama’s re-election campaign, it presents partly as a fictional reboot of his idealized bill of sale for progressive reform. But the kicker is that Morris is subject to the same faults and underscored by the same underhanded ratfucking that has sustained but eroded American politics for decades. And Meyers is his swiftly disillusioned dagger-wielding mastermind, doing bad in order to do good. No other reasonable functional set of practices is acknowledged as being possible. The Ides of March means this cynicism to appear worldly and sophisticated and it’s isn’t not that, but it also manifests as a failure of moral imagination. If there is a better way, this movie is not the place to find it.